Homemade pasta is one of those simple pleasures in life that no one should be without. Takes you back to your playdough days so it does. From such basic ingredients you can make a plate of tasty, comforting carby goodness. I always use the basic pasta recipe from the Silver Spoon cook book, which I will post about at a late date because it's as essential as your left lung to own. It says you need 200g of plain Italian type 00 flour and 2 eggs for 4 people, but I always do 100g / 1 egg per person. Oink. Bar a pinch of salt that is your basis for fresh pasta. Sift the flour into a mound and make a little well in the centre. Crack the eggs into the well and add the pinch of salt. Using a fork, gradually combine the flour and the egg, working from the inside out. Using a larger quantity of the ingredients makes this easier as your flour "mountain" is less likely to erupt and have an egg overflow, but that is all part of the fun and games - just clear a big space on the worktop! Knead the dough for a good 10 minutes and really let those emotions go! Some of the best pasta I've made is when I have had a hard week at work. If the dough is too soft or sticky, add more flour and if too hard add a little water. It is only experience that lets you know when you have it right, but it's not rocket science, it should be firm, elastic and smooth. Shape into a ball, cover with clingfilm and place in the fridge to rest for 15 mins to half an hour. 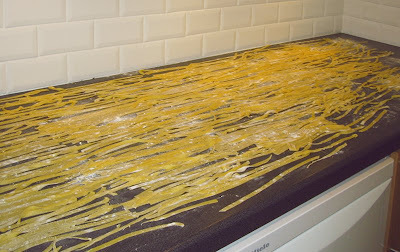 You can the roll out the pasta to make sheets by hand using those really long rolling pins if you have one or use a pasta machine and then cut your tagliatelle, lasagna, ravioli or tortellini. This time for my ravioli I did a spiced mince beef filling but I also like the classic ricotta or even a roasted squash filling. Experiment, just make sure the filling is not too liquid and the edges are sealed well. 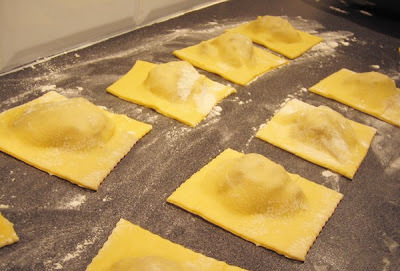 I use a little ravioli wheel for the edges as it seems to secure the little parcels better. I just need to work on getting the pasta even thinner than it is here, but it the thinner you roll out you pasta the harder it is to manage. Traditionally the pasta sheet is left quite thick than we are used to today in restaurants or shop bought. My mother's pasta is still this thicker traditional type and I love it, but I do go a bit thinner myself. I always make "a little" tagliatelle while I have the machine out too. It cooks better if you leave it on the side to dry for a while and when that's done, you can pop on trays and freeze it, transferring it into a bag once frozen for space saving. Brilliant for super quick midweek meals - sling it still frozen straight into boiling water. And that's it. Just remember when cooking fresh pasta to add olive oil to the boiling water to prevent sticking.